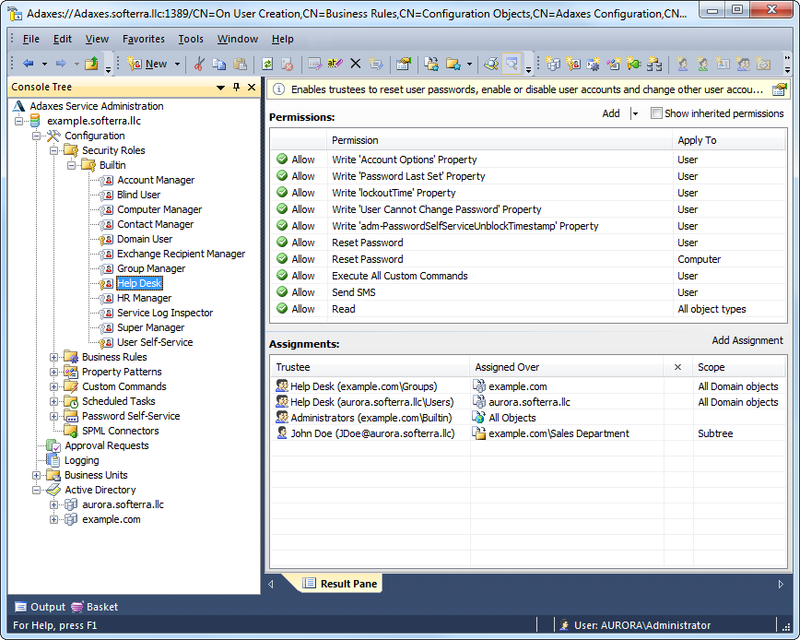 Active Directory identity management is a vital process that requires proper organization and planning. Without a solution that allows you to automate, standardize and centralize the process, management of identities in Active Directory will be ineffective, labor-intensive and very expensive. Automation and centralization of the Active Directory identity management increases the security of your Active Directory environment, enhances control over the entire process, improves standardization, and reduces errors by minimizing human involvement. Native tools for Active Directory management (such as AD Users and Computers) aren't powerful enough to enforce business rules and policies, do not provide any means for automation of Active Directory identity management, and are almost useless when you need to delegate Active Directory tasks to non-IT staff or provide self-service functionality to users. Active Directory automation allows you to automate provisioning of new Active Directory users, management of existing users, and deprovisioning of departing users. Role-based security model allows you to securely delegate tasks associated with Active Directory identity management to non-administrative staff without modification of native Active Directory permissions. Enforcement of enterprise standards on the data stored in Active Directory ensures compliance and consistency with organization's policies. Approval-based workflow provides a standardized approval process for Active Directory identity management. Active Directory Web Interface allows controlled web-based access to Active Directory for administrators, help desk operators, support staff, and enables user self-service. One of the most challenging aspects of Active Directory identity management is effective provisioning, management and deprovisioning of Active Directory users. 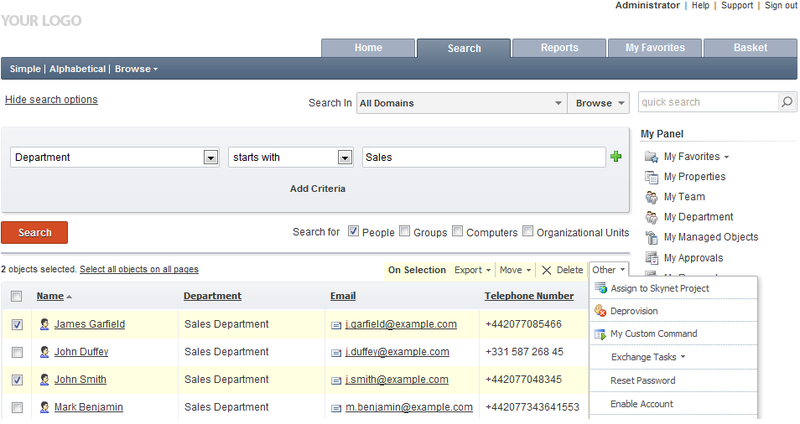 Users need access to various resources depending on their role in the organization. When a new employee is hired, promoted, or discharged, IT staff need to perform a series of manual and time-consuming provisioning operations that are often accompanied by errors and problems. Softerra Adaxes enables you to facilitate Active Directory identity management by automating the entire process of Active Directory provisioning. 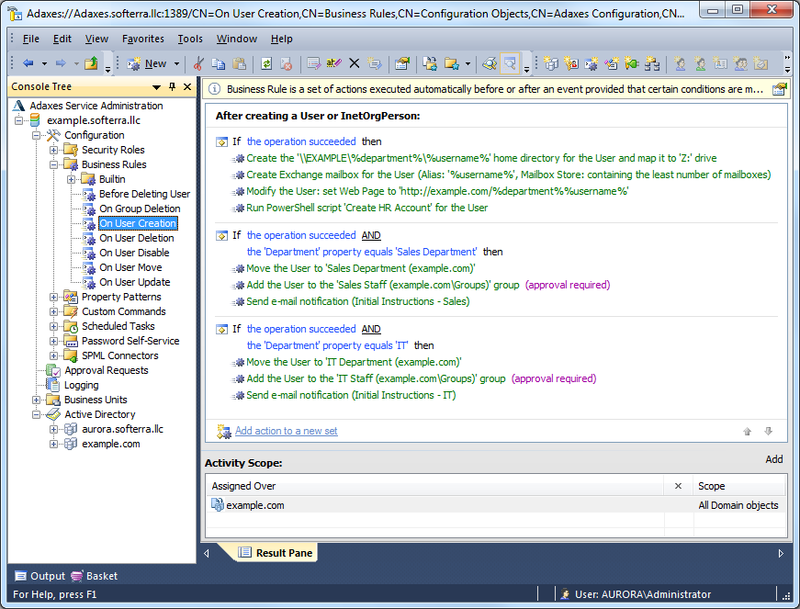 With Adaxes, all the necessary operations can be executed automatically based upon certain conditions and rules. Another essential step to increase the efficiency of Active Directory identity management is to automate the management of group membership. This is important as it allows you to ensure that new users have immediate access to necessary resources as soon as they begin working; when users leave or their responsibilities change, unnecessary access is revoked, and new access is granted without delays and unnecessary burdening of IT staff. Active Directory identity management involves a number of simple but labour-intensive operations (like password reset, account unlock, user update and rename) that substantially increase the workload of AD administrators. It is highly reasonable to transfer those routine and time-consuming activities to non-administrative staff, thus letting IT professionals focus on more complex and important issues. The role-based security model of Softerra Adaxes enables secure and granular delegation of administrative tasks to non-administrative users without modification of the native Active Directory permissions. The rights necessary to perform a certain business function are grouped in Security Roles (like Help Desk or HR Manager) that are assigned to users in accordance with their job role in the organization. 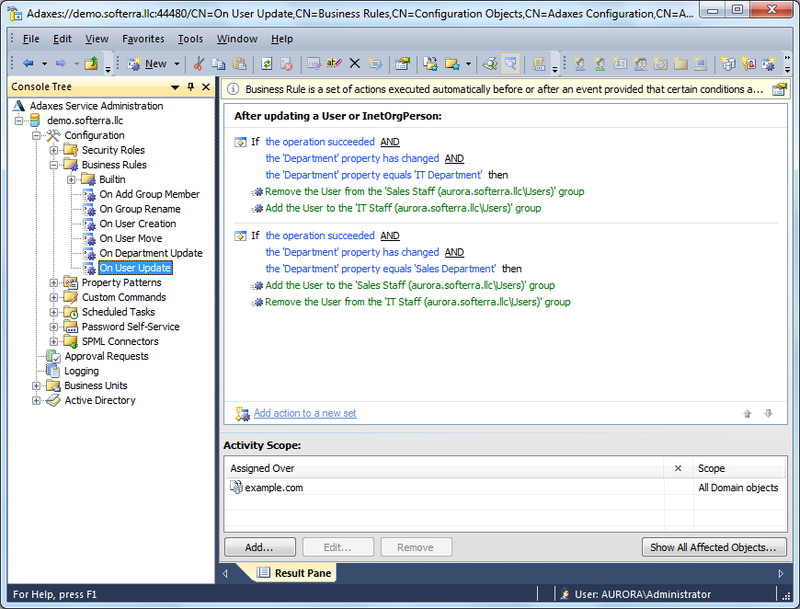 This approach makes security management much more simple and traceable as it allows you to securely and reliably delegate responsibilities to groups of users performing the same job function, and eliminates the need to manually maintain multiple sets of permissions across Active Directory. For more details, see Active Directory Delegation. 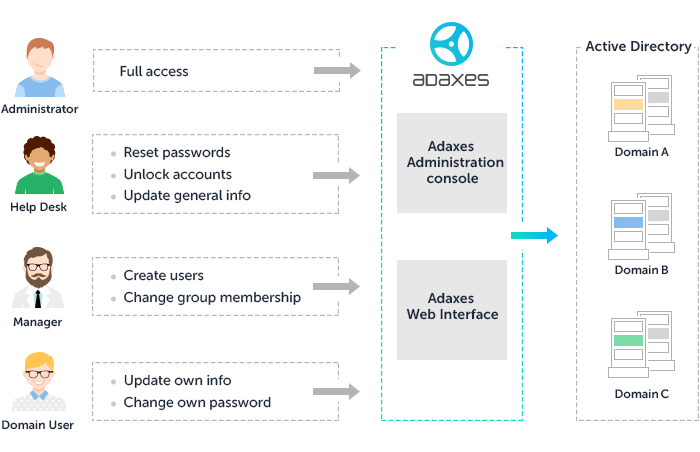 Adaxes includes a friendly and easy-to-use Active Directory Web Interface that allows users with delegated permissions to perform tasks related to the Active Directory identity management via a standard web browser. To increase the control over Active Directory identity management processes, Adaxes provides the capability of allowing critical operations to be performed only after they are approved by a responsible person. The approval-based administration allows you to delegate more administrative responsibilities to users without decreasing security, as you can control how these responsibilities are performed. For example, you can allow users to modify their Active Directory group membership by themselves, but put the operation under the control of their managers or AD administrators using approvals. Another serious problem associated with Active Directory identity management is to ensure that the data stored in the directory is complete and complies with the established requirements. Native Active Directory tools do not provide any means to enforce the integrity of the information entered into Active Directory and allow users to enter data in any format they want, leave important fields blank, incorrectly spell or abbreviate the names of departments, job titles, etc. Not only does this complicate access to important information, but may cause significant problems if you have applications in your infrastructure that rely on the identity information stored in AD. 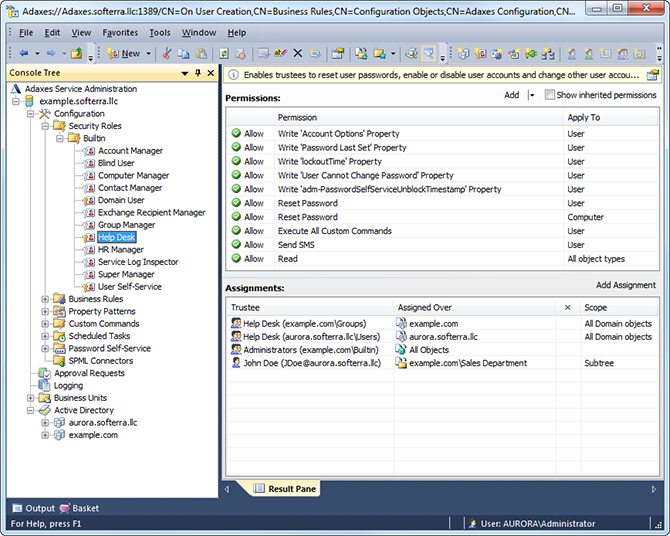 These challenges of the Active Directory identity management can be easily addressed with Adaxes. Adaxes equips you with the ability to ensure the uniformity, format, and completeness of Active Directory data across the entire organization. For example, you can specify that the Employee ID property must always be entered for AD users and define how this property must be formatted. Or you can specify that the Department property can contain only 'Sales', 'IT' and 'HR' values. 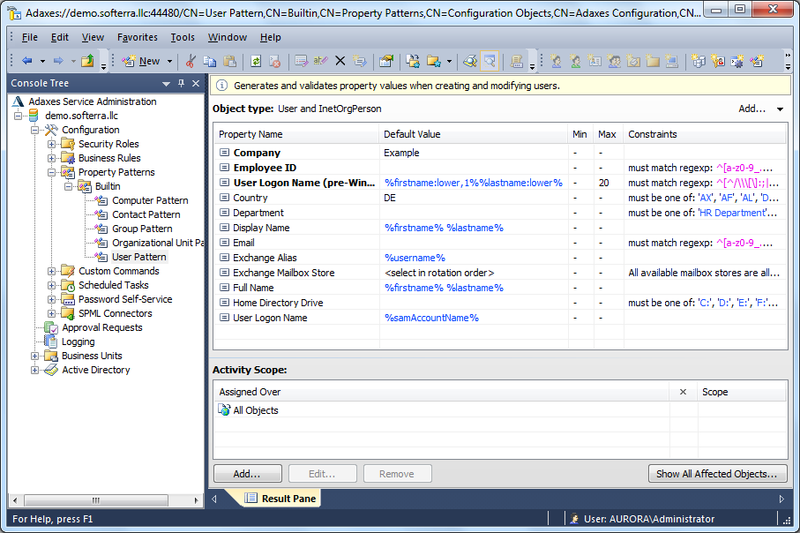 Also, Adaxes lets you streamline Active Directory identity management due to its ability to automatically generate property values for Active Directory objects using templates (e.g. %username% or %department%). 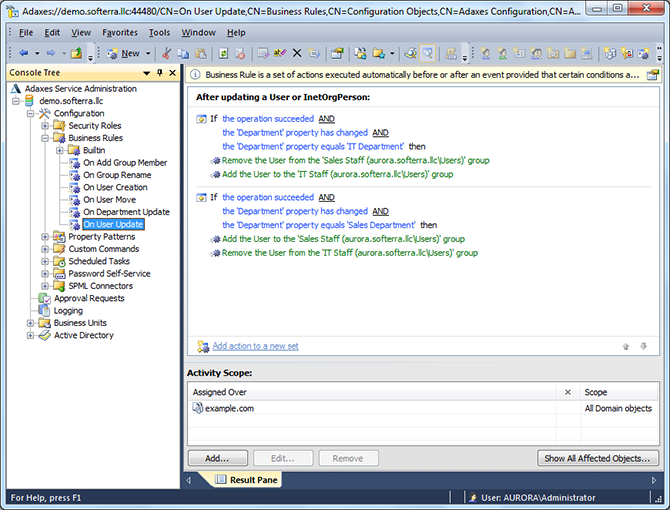 Adaxes is a complete solution for the Active Directory identity management that significantly increases control over Active Directory, allows you to automate user provisioning and deprovisioning, enables role-based delegation of Active Directory management tasks, lets you achieve and efficiently maintain compliance in Active Directory through enforcement of organizational standards. As a result, Softerra Adaxes decreases administrative costs, increases security, streamlines and centralizes the whole process of Active Directory identity management. To learn more about the Softerra Adaxes, see Adaxes features, and Adaxes tutorials.